EghtesadOnline: Venezuelans on Sunday vote for a constitutional super-body expected to hand sweeping new powers to ruling Socialist Party officials and potentially extend their unpopular rule in the convulsed OPEC nation. 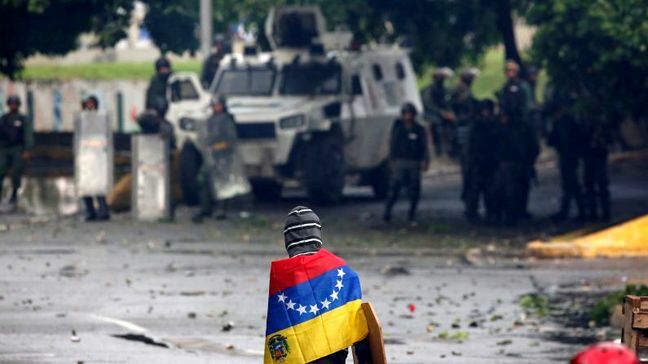 President Nicolas Maduro, widely disliked for overseeing an unraveling of Venezuela's economy, has promised the assembly will bring peace after four months of opposition protests during which more than 115 people have been killed. Opposition parties are boycotting what they call a rigged election while their sympathizers plan demonstrations across the country during the day - raising the prospect of violent clashes with security forces, according to Reuters. Critics say the assembly will allow Maduro to dissolve the opposition-run Congress, delay future elections and rewrite electoral rules to prevent the socialists from being voted out. The vote, which follows the postponement of regional elections and Maduro's repeated refusal to heed decisions by Congress, has brought global condemnation. The United States, which is the largest market for Venezuelan oil, last week sanctioned 13 Socialist Party leaders, in part as a response to the election. President Donald Trump's administration has promised additional economic measures if the vote takes place. Neighboring Colombia says it will not recognize the results. "By tomorrow, it will be clear that this was not just a constitutional fraud but also the biggest historical mistake that Maduro and his gang could have made," opposition leader Freddy Guevara told a news conference on Saturday. Maduro says he is the victim of right-wing governments around the world and blames the country's economic malaise - from food and medicine shortages to triple-digit inflation - on an "economic war" by his adversaries. He says opposition protests have been driven by vandalism and arbitrary violence that will not be brought to an end without the constitutional assembly. Voters on Sunday will not be asked whether they wish to proceed with the assembly, only to select its 545 members from more than 6,100 candidates representing a broad array of Socialist Party allies. Polls suggest a large majority of Venezuelans oppose the assembly. The opposition says that more than 7 million voters - from a population of around 32 million - overwhelmingly rejected Maduro's proposal in an unofficial referendum it organized this month. Some government adversaries are seeking to block the ballot. In the western state of Tachira, a group of several hundred people on Saturday burned voting machines that had been set up in two schools. Around 50 voting centers in that state will not be in operation because demonstrators destroyed voting materials or prevented them from being set up in the first place, according to an opposition representative. The new, all-powerful assembly is due to sit within 72 hours of results being officially certified. Government leaders have suggested it will swiftly take measures against chief prosecutor Luisa Ortega, who has openly criticized the assembly vote, as well as the opposition congress. "With the constitutional assembly we're going to end the sabotage of the bourgeois (Congress)," Socialist Party No. 2 Diosdado Cabello during a campaign rally. A significant portion of the assembly's seats are expected to go to well-known party leaders such as Cabello and Maduro's wife and son. Two-thirds of the seats will be chosen by municipality, which critics say overrepresents traditionally pro-government rural areas at the expense of opposition-dominated cities. The rural state of Falcon will elect 26 delegates, compared with seven for the municipality of Caracas, which has twice the population. The remaining third of the seats are set aside for candidates from specific demographic groups, ranging from students to fisherman and farmers. Amid government fears of low turnout, Venezuela's 2.8 million public employees are under enormous pressure to participate. Venezuela last rewrote its carta magna in 1999 under late socialist leader Hugo Chavez, strengthening the executive and enshrining rights to healthcare and education. But unlike Maduro, Chavez first won voter approval for the idea via a referendum.